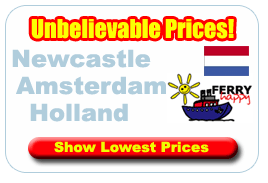 Book your Ferry from Newcastle to Amsterdam & visit the city which is no doubt one of the most beautiful cities in Europe and is known as the ‘Venice of the North’ due to its similar canal based urban structure. Amsterdam is a relatively small city in comparison to other major european cities yet nevertheless punches above its weight in terms of visitor experience. In Amsterdam you get a chilled out atmosphere far different to the cities in the UK. You will have no excuse for boredom in Amsterdam as you could enjoy lazing the afternoon away in one of the multitude of cafes and bars that are spread around the city, or you could enhance your cultural status by paying a visit to one of the many fantastic museums. The city is one of the UK’s most popular city break destinations, with canals and bridges which can be toured by sightseeing boat, bicycle or pedalo. The city of Amsterdam is well known as an art lover’s paradise, there's Dutch masters such as Van Gogh, Rembrandt and Vermeer. There's an interactive science museum that is great fun for the kids. grown up's will love the Heineken Experience which is a brewery tour which concludes with a beer tasting session.